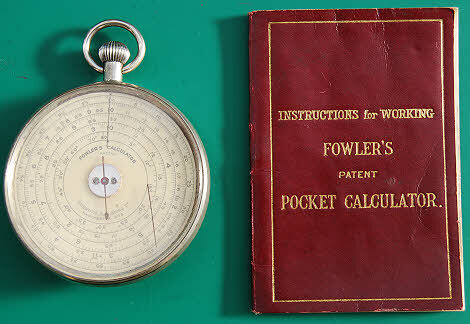 Fowler Calculators was a Manchester company that was founded as the Scientific Publishing Company in 1898 by William Henry Fowler. Besides their range of calculators, they were well known for their range of engineering pocket books that they published annually. Their address was 53 New Bailey Street (1900-9 at least) and their works were later in Hampson Street, Sale. They went into liquidation in 1988. 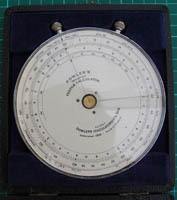 A Fowler Long Scale Calculator. 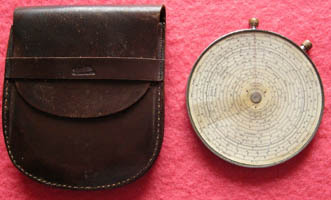 This is a two sided calculator, 2.7 inches in diameter, with a brown leather case. In the left hand picture, the outer scale is the C scale equivalent, whilst the long scale occupies the inner six rings. 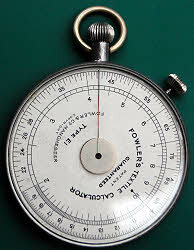 There are gauge points around the periphery of the dial which is rotated by the left hand screw whilst the right hand one rotates the movable cursor (there is also a fixed one on the glass). In the right hand picture the scales, from outside to middle are: multiplication & division (short), reciprocal (C1), logs (L), sq roots, log sin, log tan, log sin (small angles). There is no rotating cursor this side. 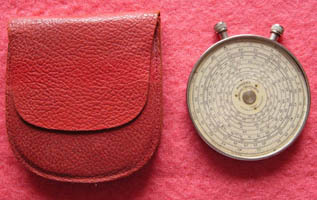 Fowler Universal Calculator, single sided, 3.4 inches diameter, in a red leather case. Scales from outside in are: short, reciprocal, log, long scale ( 3 rings), Sin, Sin (small angles), Tan. The left hand knob rotates the dial and the right hand one rotates the cursor. There is also a fixed cursor line on the glass. 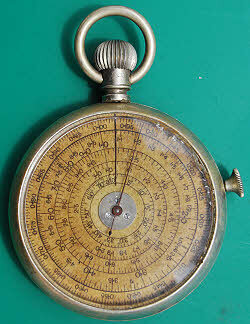 There are gauge points around the dial periphery. 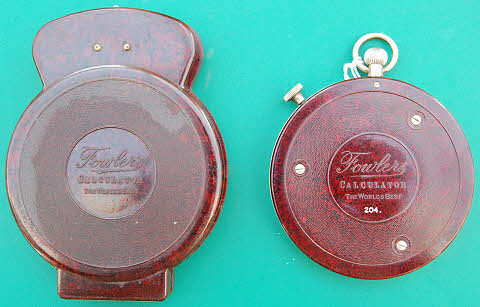 Fowler Magnum Long Scale Calculator, single sided, 4.5 inches in diameter, in a brown leather case. Scales from the outside in are: short, reciprocal, sq root (2 rings), log, long scale (6 rings), sin, sin, tan. 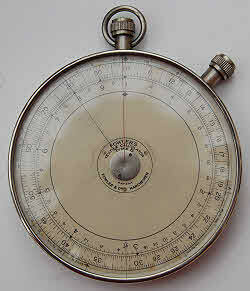 There are gauge points around the dial periphery. The left hand knob rotates the dial and the right hand one rotates the cursor. 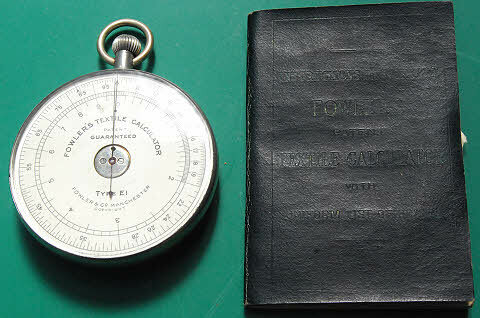 Fowler Magnum Textile Calculator, single sided, 4.7 inches in diameter, in a black leathercloth covered fitted case with blue velvet lining. Scales from the outside in are: tenths (short), eighths, sixteenths. There is also a part circle inside marked + and -. 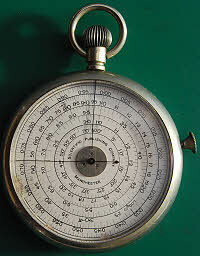 There are gauge points around the dial periphery which are mostly specific to textile calculations. The left hand knob rotates the dial and the right hand one rotates the cursor. The calculator is complete with a small 42 page booklet of instructions. 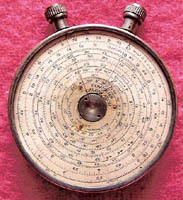 Fowler Twelve-Ten Calculator, single sided, 3.4 inches diameter. 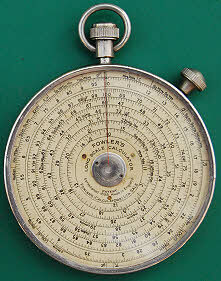 Scales, from the outside are: short (tenths), reciprocal (tenths), short (twelfths), short (twelfths), sin, sin, tan. There are conversion gauge points around the periphery. The left hand knob rotates the dial and the right hand one rotates the cursor. There is also a fixed cursor line on the glass. The outer twelfths scale is actually decimally divided with the inner duodecimally divided (e.g. for feet and inches). 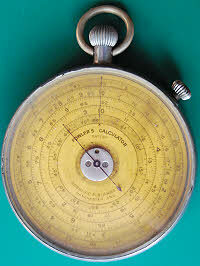 This calculator originally had a ring round the upper winder, which has been lost. 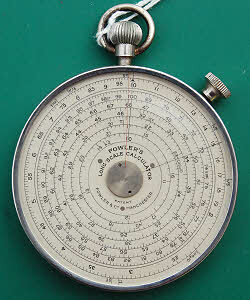 Fowler Textile Calculator Short Scale Type, single sided, 2.6 inches diameter. The left hand knob rotates the dial and the right hand one rotates the cursor. Scales from the outside in are: tenths, eighths. 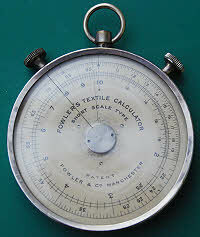 Fowler Textile Calculator type B. Single sided, 3.4 inches diameter. 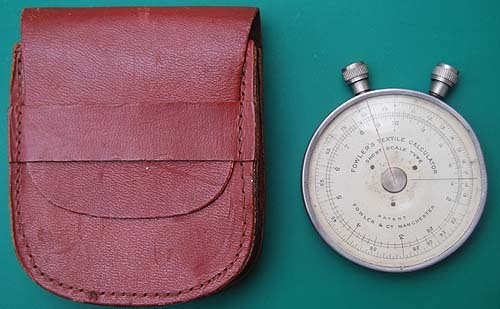 It has a smooth brown leather case and also a book of instructions. 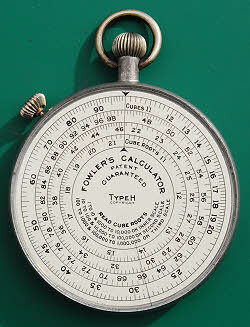 Another version of the Type B Fowler Textile Calculator. This one is 3.2 inches diameter. 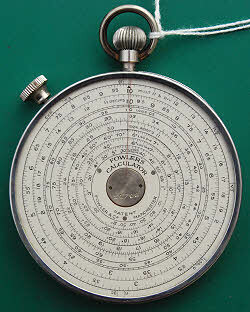 The Jubilee Magnum calculator was introduced in 1948 to celebrate the 50th anniversary of the firm. It has a leather case. This example actually dates from 1948 and is complete with the interim instruction sheet and an instruction booklet for the Magnum calculator. The interim sheet said that the Jubilee Magnum instruction booklet would be issued later on request and there is a copy of that instruction booklet too. Diameter 4.7”. 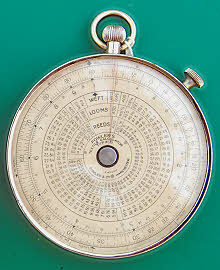 The Scientific Publishing Co Fowler’s Patent Pocket Calculator was patented in 1910 (5528/1910). 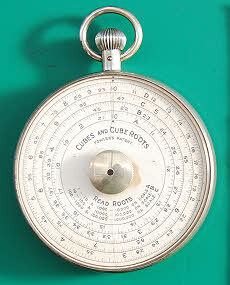 It is 2.7 inches diameter and the front scales are for multiplication (3 scales), logs and sines. The rear scales are for finding cubes and cube roots. The crown drives the front dial and the button in the centre of the back drives the rear dial and the pointer (broken) over the front dial. 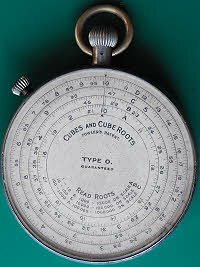 This style of calculator was only made in the 1910-1914 period. It has a maroon card case. 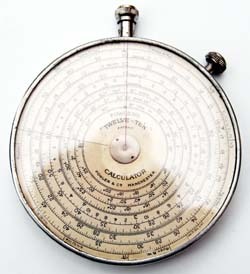 This is an earlier version of the Long Scale Calculator shown at the top of the page. Whilst that one is ca.1950 this one is probably ca.1930. It has a nickel plated case. The scales are the same as the one at the top of the page. A rare form of the Fowler type B textile calculator that has a Bakelite back and Bakelite outer case, This one has serial number 204. Date late 1930s. 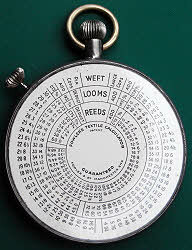 Besides the scales seen on other type B textile calculators this has a table of Wefts, Looms & Reeds. This unnamed calculator is the first type of “Mechanical Engineer” calculator sold by the Scientific Publishing Co. The crown rotates the entire scale whilst the knob on the side rotates the pointer. Date ca.1900. The case is nickel plated brass. Some of the plating has worn away and the edge of the glass is chipped and was loose. I refitted the glass to the bezel after first removing the bezel to make it more flexible. The outer scale is calibrated from 0 to 1 in even increments. The next scale is a single radius log scale for multiplication and division. The next two circles combine to form a log scale that, when used in conjunction with the single radius log scale allow squares and square roots to be found. The inner scale in degrees is used with the outer scale to give sines. 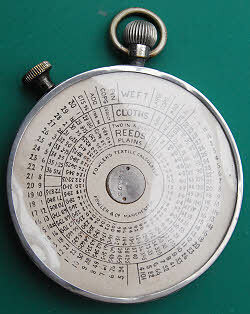 Fowler Textile Calculator, Short Scale Type. Unlike the later one above this is double sided with a table of Weft, Cloths and Reeds on the reverse. The crown rotates the dial and the wheel on the edge rotates the pointer. 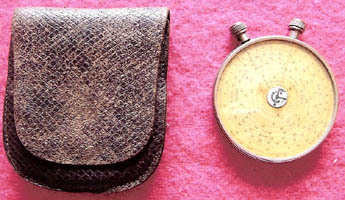 It has a press-stud fastening leather case. It is 2.7” diameter. 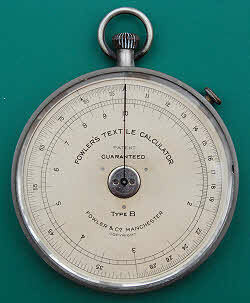 Fowler’s textile calculator type E1. This is the patent type where the crown rotates the front dial and the button in the centre of the back rotates the pointer. There is a 92 page instruction booklet and it has a stout, maroon card case with a hinged lid. Probably ca.1914. Serial no X585. 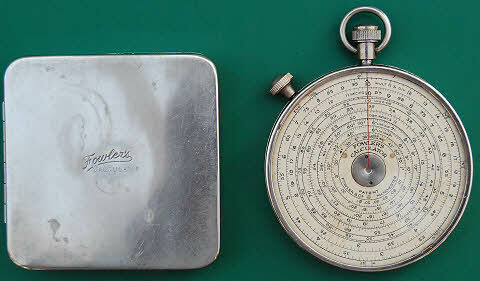 Scientific Publishing Company, Manchester calculator probably dating from 1907-10 and probably made in Switzerland. Face diameter 2 inches, overall diameter 2.4 inches. The crown rotates the entire scale whilst the knob on the side rotates the pointer. Fowler type E1 textile calculator serial no 1101. 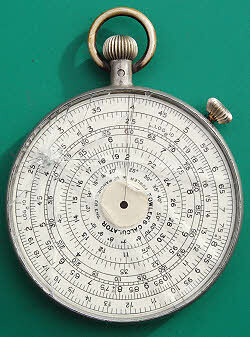 This is the later type where the crown rotates the front dial and the smaller thumb wheel rotates the pointer. Probably ca.1916. It is the same size as the one above. Yet another long scale calculator. 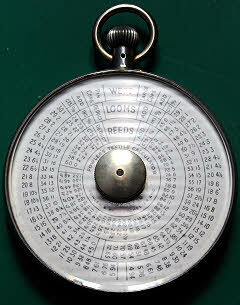 It has a different crown wheel, simpler second side without the multiple gauge point labels and ribbing round the edge of the case. Its case is the same as the one above. 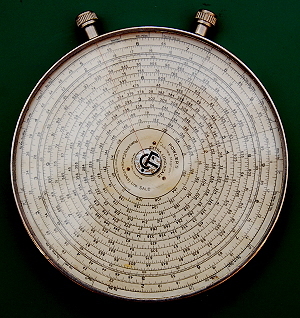 Scientific Publishing Co “Fowler’s Calculator Type O”. The front face (yellowed) is rotated by the crown wheel and the pointer (tip detached) and rear face are rotated by the smaller wheel on the side. This rare calculator was probably made ca.1913-1914, just before the Scientific Publishing Co name ceased to be used on the calculators. 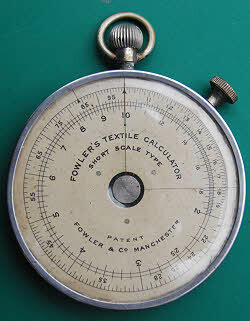 Fowler Textile Calculator Short Scale Type serial no. 6638. 2.7” diameter. Looking from the front the left hand screw turns the dial and the right hand one the pointer. 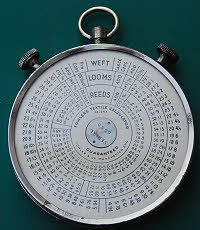 This is the 3rd variant of this calculator in my collection, the first being single sided, the second double sided but with a at table of Weft, Cloths & Reeds, whilst this has Weft, Looms & Reeds. This also has the less common arrangement of two thumb screws equally displaced either side of the ring. It has a cloth covered & padded card case and instruction leaflet.